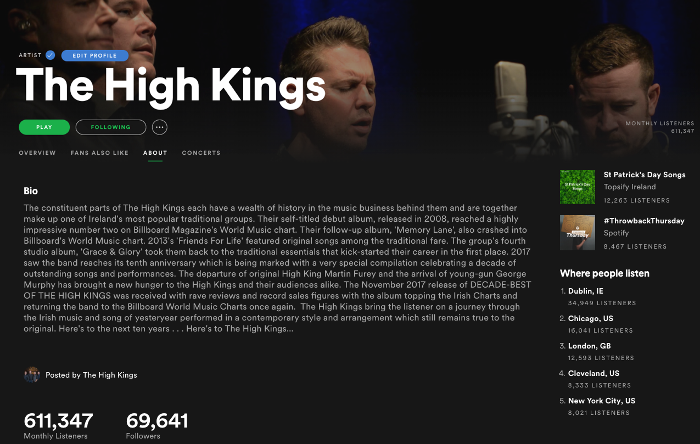 The High Kings Spotify profile has seen steady growth over the last year. There has been widespread listening the last few weeks with St Patrick's Day and general Irish celebrations taking place, we've had over 60,000 monthly listeners through March. Our Spotify followers have now reached over 69K and we are aiming to hit the 70,000 followers' mark in the next few weks. Please share our profile link and latest playlist with any potential High King fans, help us reach that 70K mark as soon as we can !